‘Catherine ‘Cat’ Palmer realises, too late, that bringing an adorable puppy into work at the local nursery was a bad idea, especially after the ensuing chaos gets her the sack. As a fellow Novelicious Undiscovered finalist in 2012 I got to know Cressida McLaughlin a little bit and I knew not only how passionate she was about writing, but hard at work with it too. So I felt so pleased for her when I saw the news that she’d secured a deal with Harper Fiction and was thrilled to read her work. Wellies and Westies is the first novella in a series of four (all as e-books), all set in Primrose Terrace, with the full novel being available towards the end of the year, and as a paperback version. As a dog lover the synopsis along with the amazing cover really drew me in, this sounded like just my cup of tea. I’ll be honest and say I found the situation of Cat sneaking a dog into nursery a little silly and unrealistic, but once that part was over--which was quite quickly--I began to really enjoy this novel. Cat is a positive character, willing to make her dog walking business succeed and she embraces the community around her, a community she’s only just getting to know herself. I really liked her personality, her ethics, her quirkiness and of course her love for our canine friends who feature quite a bit, just as I’d want them to! 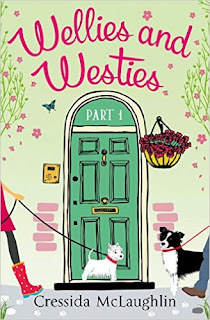 I enjoyed Cressida’s style of writing, it flowed well and there were some funny moments in this and a great sense of place which seemed key for this type of book. There was also a good level of build up and intrigue as to where Cat’s love-life would be heading. I’m not particularly into installments of books and even though I enjoyed this I think I’d personally wait until the full book is released before reading more. But how great that readers will have that choice to buy the next installment or buy the whole thing. I personally think this novella would have needed a stronger ending to draw me in and make me order the next installment right now. Nevertheless I would read more, I enjoyed meeting the different characters and there was definitely intrigue set in wanting to learn more about some of them. A recommended read from me, especially for the doggie lovers out there! Thanks to Harper Fiction for the book in exchange for an honest review. You're in luck because it HAS been released as a full book! It's called A Christmas Tail, and includes all four parts. I got a paperback copy for Christmas.